Earth Diggers can organise all your Laser Levelling. Used for levelling uneven surface’s and getting trench depths level.Laser leveling are used in construction to determine and set the elevation of construction elements. 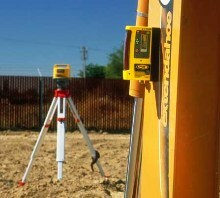 Laser leveling helps in getting accurate and fast level operations covering a wide area. Once it is set up, leveling work can be done by one person with an ease. When it is used outdoors, laser levels are almost always used with a receiver attached to it and the rod will be attached to a laser control machine. It makes work very easy and with accuracy the work is done in time. In case of inside work a visible beam often guides the construction work and sometimes a receiver also can be used. We can arrange all kinds of laser leveling work and our clients will not have do lift a finger also. All the work is delivered at the given time limit. The laser levels are used for leveling uneven surface’s and getting trench at deeper level. We have a panel of expertise and they are well experienced. They are the best in town and hiring them call be the best option for those work where perfection is required. We provide free quotes, when our clients call us. Our packages are designed to take up and dig or small projects, we have solutions for all. We tends to tailor our services according to your requirements. we are based in Adelaide and South Australia and have years of experience in the industry. With the most innovative technologies, we promise to deliver just the concrete work that you have quoted for and can completely rely on us for the perfect finish. We tailor our packages according to our customers need. Keeping the environment in mind, we clean the site after work and leave you with a beautiful finish. Our is team always focused on accuracy, reliability, promptness, quality, and reasonable pricing and working accordingly. Call us now for your concrete cutting work and get free quotes against your booking. Earth Diggers can do all concrete cutting, including the cutting up and removal of concrete driveways, paths, old shed floor slabs. We are also able to level the ground for you once the concrete is removed.